The school year is upon us (sorry to bring that up) and it's time to get everything in place for the upcoming semester that is sure to be crazy-busy! One of my goals for this school year is to meal plan and eat healthier. And in order to do that, I have to start out with an organized refrigerator! My husband would jump at the chance to tell you how in-kitchen savvy I am, so today we have someone who is: Patricia from Domestic Cleaners Stockwell. Here are her top tips for getting your fridge-life together! When you are up to provide extensive cleaning of your fridge you need to keep in mind several important tips. If you want reorganize the fridge and to clean it in an effective way, you should make significant changes there and rearrange pretty much everything. Cleaning and organization of the fridge is not so difficult as long as you are well acquainted with the right instructions. After all, when you have a clean fridge, you can be sure that the food won't be contaminated and that you will be able to enjoy your fresh meals without any preoccupations. Read the following lines to explore new ways in which to reorganize your fridge. Follow these 10 steps and you will easily put some order in your fridge, regardless of its size. Before taking up with any cleaning or organizing, you need to empty the fridge from all the food and other ingredients, situated there. This way it will be easier to apply the cleaning procedures and to decide how exactly you want to rearrange the things. After removing all the ingredients from the fridge, you can start with the cleaning. For the purpose you will need some vinegar, warm water and a suitable rug to wipe down everything. As far as the shelves and drawers are concerned, they also need to be cleaned carefully and one of the easiest ways to do this is by putting them in the dishwasher. Look carefully the food that you had taken out from the fridge and check out all of the expiration dates. This will save you up a lot of troubles and you will leave more free space for other ingredients. Imagine how easy it would be to have your items arranged in the fridge due to their type. You will spend less time wondering where your favourite salad dressing is if you have arranged all of them in one line. Storing your food in plastic containers is excellent option when you want to organize your fridge in a better way. Another advantage of the plastic containers is that they will keep the leftovers fresh for a longer time. Keeping the fruit and vegetables in baskets is always more hygienic decision that leaving them directly on the shelves. Labelling the baskets and the containers is a wonderful idea – this way you will easily find all the ingredients that you need. Instead of labelling all the containers, you can simply use a dry erase marker and to write down some brief notes on the fridge door. Once you reorganize your fridge you need to maintain it that way and to check out the expiry date of the ingredients. Make sure that you provide a regular cleaning of the fridge and check every side for accumulated mould. 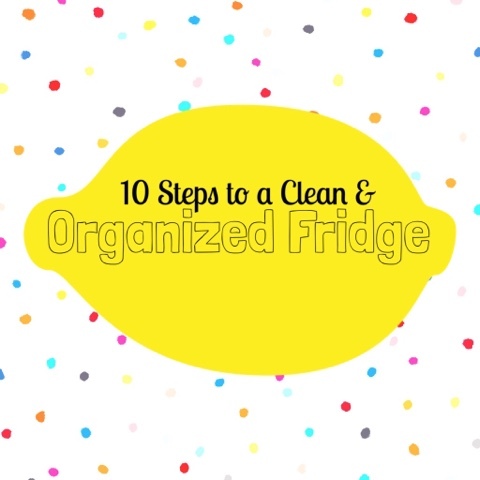 These are the top 10 steps to follow when rearranging your fridge. Do not hesitate to experiment and to organize everything according to your taste and preferences. You will feel more comfortable when you get rid of the spoiled food and when you can find your food in the fastest possible way. Experiment with different containers and baskets to use the space in your fridge in the best possible way. The article is contributed by Patricia J. Cornwell. She runs the company DomesticCleaners Stockwell which is situated in London.